Modern SUV a little too bluetoothie for ya? This 1959 Land Rover Series II Model 109 (auction at $82,000 and rising) is what a SUV should be, with seating for ten, a “tropical” roof, and robust construction all wrapped up in a like-new condition vehicle thanks to a full restoration by well-known Land Rover enthusiast Lanny Clark. Bonus: the whole thing was restored using only original parts. Auction item. 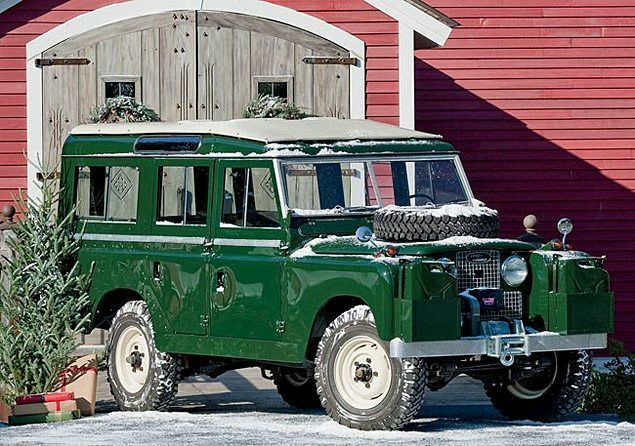 This extremely rare 1959 Land Rover Series II Model 109 Station Wagon has been fully restored to its original factory condition by Lanny Clark, a man of remarkable reputation in Land Rover circles who devotes himself full-time to the restoration of these timeless vehicles on his farm in Vermont. This is the first year this model was built and it was only built for two years. Land Rover then changed to the IIA to reduce cost, so this model is not only rare, but even more substantial than its successors. Most restorations use aftermarket parts, but this car was fully restored by Clark with original parts, making it an even more rare and practically irreplaceable vehicle. This car is a 10-seater with tropical roof delivered at the factory in 1959 in Solihull, England. It then toured Europe and the British Isles in its early days before coming to Boston through the port in Newark. It was driven to the World’s Fair in Seattle in 1962 and then returned via Alaska and Canada. For the next 20 years it was used on a farm in Massachusetts with annual fishing trips to Canada and the Northeast. It was stored in a barn until 2001 when it came to Clark, who recently brought it back to its original splendor. A winch was installed as an extra feature. This car is being auctioned through December 18, 2010.